How to create barcodes in React (ReactJS/JSX)? The ConnectCode package comes with sample React component templates for all the different linear barcodes and are available in the "<ConnectCode Folder>/Resource/React" folder. The tutorial below shows how to get started quickly with the sample React app. npm 5.2.0+ is installed. npm is distributed with Node.js. ConnectCode Barcode Software and Fonts package is installed. In this documentation, we assumed you are using Windows for your web development. Please be assured that all the fonts and React scripts from the installed package can be run on other platforms such as Linux or Unix. create-react-app is installed. You can use the command "npm install -g create-react-app" in Windows Command Prompt to install the create-react-app. If the Command Prompt displays an error, make sure you have installed the create-react-app listed in the prerequisites. 2. 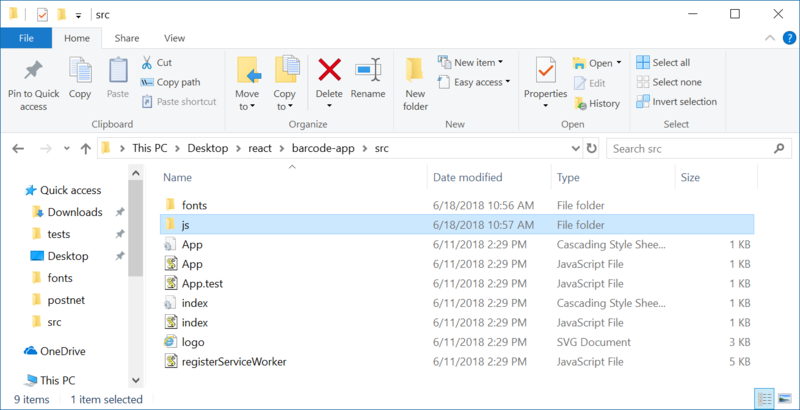 Launch Windows Explorer and go to the "<ConnectCode Folder>\Resource\React" folder. Be default, the ConnectCode installer installs the package into the "C:\Program Files (x86)\ConnectCode" folder. Copy all the files and subfolders and place it in the "react-barcode-app\src" folder. You should see the sample React app and a Code 128 barcode displayed using a W3C compliant web font. Other linear barcodes are also supported. You can refer to the Application Programming Interface section for more details. How to create barcodes in React (Reactjs/JSX) from scratch? In this tutorial we are going to create a Code 128 (Subset B) barcode React component. 3. Copy the "js" and "fonts" folders to your "barcode-app\src" folder. The "encode" function takes in an input data as a parameter and return barcode characters that when applied with the WOFF font gives you a barcode. For more information on the parameters required for the different barcodes, you can refer to the Application Programming Interface section. The "getText" function returns the human readable text that commonly appears below a barcode. This function only returns a valid value if you have executed the "encode" function earlier. 5. We have created a basic component that takes in an input "12345678". The component returns a string of output characters (the barcode) and a human readable text. Next, we need to apply the WOFF barcode font on the output characters to display the Code 128B barcode. Right click on App.css and "Open with"->"WordPad". Add the following font-face tag to the css file. Note - Replace "ConnectCode128_S3.woff" with "ConnectCode128_S3_Trial.woff" and "CCode128_S3" with "CCode128_S3_Trial" if you are using the trial version of ConnectCode. The ".barcode" CSS class uses the WOFF Code 128 barcode font specified in the "font-face" tag and sets the font size to "32px". The ".barcode_text" CSS class specifies a "sans-serif" font and “32px” font size for the human readable text below the barcode. You can adjust the values of the CSS classes for the desired size of your barcode. One other thing to note is the ".._S3.woff" wordings of the font name. The registered package of ConnectCode Barcode Software and Fonts comes with fonts of varying heights. For the Code 128 barcode, the following fonts are available. "..._S1.woff" is a font with the shortest height while "..._S7.woff" is the font with the largest height. The height of the fonts together with the font size enables you to create a barcode of your desired size. The different fonts have been carefully crafted over many years for creation of compliant barcodes that meet all the requirements of all industry specifications. In this case, we are using a font with the ".._S3" height. 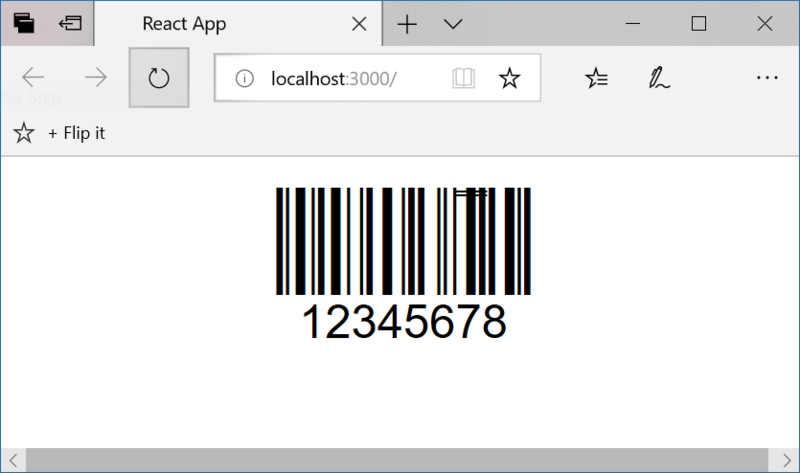 Also check out our React Barcode Application Programming Interface if you need information on how to generate other types of barcodes.